Imagine the romance of a table for two in a wilderness setting under a canopy of the Southern Night Sky. The only light comes from the moon and the flickering glow of the fire. The only sound is from the whispering of the breeze through the Desert Oak trees and the crackling flames. While you soak up the atmosphere , a superb four course set menu is served, accompanied by some of Australia's finest wines. 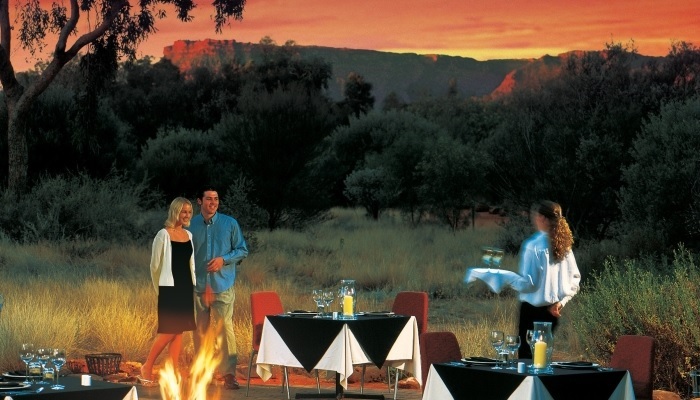 This is Under a Desert Moon, an exclusive dining experience at Kings Canyon Resort. It's designed for intimacy an romance with no more than eight couples dining on any one night. Under a Desert Moon is a wonderful way to unwind after a day hiking through Kings Canyon and Watarrka National Park. Join a guided climb to the rim of Kings Canyon. Marvel at the breathtaking views of Watarrka National Park and into the canyon itself before desending into the green oasis of the "Garden of Eden". The walk is rocky and steep in places and is recommended for those with a good level of fitness. Alternatively you may wish to explore the canyon floor; an easier shady walk that follows a trail between the two walls of the canyon. Departs: Daily between 5.00am & 8:00am depending on sunrise time & weather. 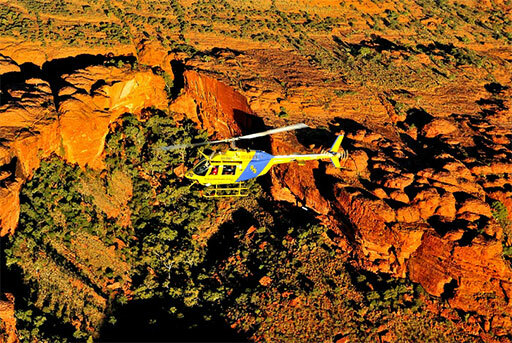 An aerial tour is the only way to fully appreciate the scale and grandeur of this spectacular Canyon and the rugged region surrounding it. For those on a budget or with limited time, this gives you the opportunity to grab some aerial photo's while you are there. An extension to the Kings Canyon tour, taking in the George Gill Range to Kathleen Springs, over to Peterman Pound where you have a chance to see camels and brumbies, then follow Dry Creek back to Carmichael Crag. Please Note: Whilst tours do go ahead in wet weather, itineraries may be altered to suit weather conditions. Where applicable - child rates apply for 5-15 years. Cancellation Policy: 100% refund on bookings cancelled 7 days prior to touring. Nil refund if bookings cancelled less than 24 hours prior to travel.